Promotional product samples are a great way to try a product before buying it. Place an order for the promotional Soccer Ball Key Chain Stress Reliever! Our polyurethane stress relievers are the perfect item for your next promotional giveaway. Max Imprint Colors: Between Black Spots - 1 Color Max. 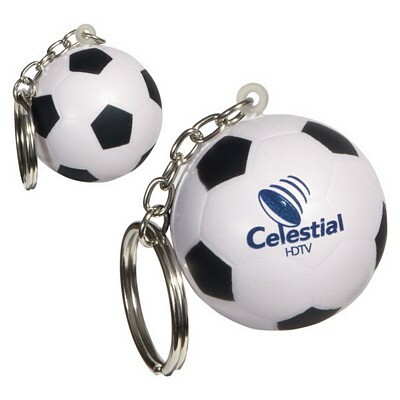 Be The First To Review our Promotional Soccer Ball Key Chain Stress Reliever at The Executive Advertising! At The Executive Advertising we offer tons of great promotional products like our Promotional Soccer Ball Key Chain Stress Reliever decorated with no setup fees! Custom Soccer Ball Key Chain Stress Reliever Item #LKC-SC06 (Min Qty: 150). Decorate your Promotional Stress Relievers with your business logo and with no setup fees. If you need any help just contact our customer service staff at 800-338-7996. Popular Searches: Search Terms that got you to this promotional product are Promotional Soccer Ball Key Chain Stress Reliever, Customized Soccer Ball Key Chain Stress Reliever, and Soccer Ball Key Chain Stress Reliever Printed with Logo. You can also view our related products or categories to locate similar items to the Soccer Ball Key Chain Stress Reliever.